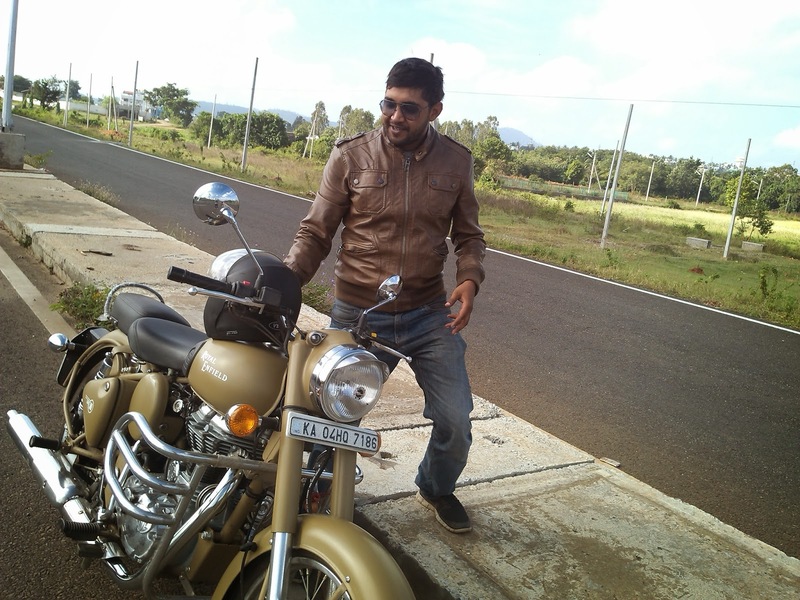 I had been thinking of taking my bullet for a long ride since the day i had got it , and the opportunity presented itself when on one friday Amit (a friend and co-founder of the company i work for) along with another friend Anoop were discussing about the bike trip. Anoop hails from Calicut, Kerala and was planning to visit his parents. Amit suggested we could go till Sultan Batheri which is on the way to Calicut and return back , either the same day or the day after. I was super excited and agreed immediately. The plan was to leave on Saturday morning and return back the same day or to stay over at Sultan Batheri and return the next day. I decided to meet Anoop at Silkboard at 3:00 AM the next day and then join Amit at the NICE road toll. I left office early as i did not have a riding jacket or any jacket for that matter, so i decided to get one. Looked through multiple stores for a very long time but wasnt able to find anything good, finally around 9:00, i found a leather jacket which i liked and was on my way back home. Sharath , our HR gave me a call and informed that he would be joining for the trip too and as he stayed close to my place i asked him to meet me at 2:00 AM the next day near my place. The bike had got his first service recently, so i did not have to worry about anything else. Just got the tank fueled up, checked the tyre pressure and was set to leave on my first long bike trip. Sharath : Hey man, Still sleeping? Sharath: I am starting now and will be near ur house in 10 mins. Me: WHAT? i need atleast 30 mins to get ready and we were to meet at 2 right? Sharath: i Will be there in 10 mins, come fast. Dont want to wait for long as cops would be patroling and would ask unnecessary question. Got ready in hurry and was out of my gate in 15 mins, in the meanwhile, First thing that struck me was 'Damn its cold' , had not been out that early in a while. Sharath had already called me 3 times. So i met him near my place and we left for silk board.Stopped on the way for some tea/smoke break and were at silkboard much before the decided time. Anoop got up to my call and said he will meet us in 30 mins. Well knowing Anoop its never 30 mins, when he says so. And this time wasn't any different. He finally reached silk board after an hour or so. He had a pillion with him, his friend Pratap who was ttravelling with him to calicut. We were introduced, exchanged pleasantries and were on the way to NICE road toll where Amit was to join us. We reached NICE road toll, Amit joined us a few mins later and the journey began. It was a great feeling riding in dark , good cold weather and smooth roads with no traffic or potholes to interrupt. I was speeding upto 80-85 kmph whereas Amit and Sharath were long gone, i could hardly even see their taillights. After a few kilometres i had lost all of them, anyway it was a straight road so kept riding at my pace hoping to catch them up ahead. Rode non stop for around hour and half and when i still could not find them, i stopped near Maddur to have a coffee and smoke. As i had taken the first sip my phone buzzed, it was Sharath. When i told him where i was , he informed me that they were waiting for me approximately 5 KM ahead. I left my unfinished coffee on the bench and met them a few kms ahead as Sharath had told me. We had some tea/coffee and continued towards mysore. This time we rode together checking from time to time in rear view mirror for others. 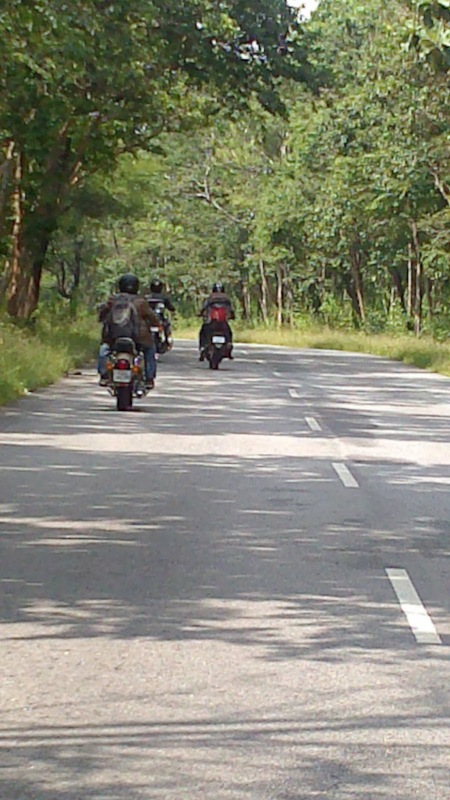 The roads were good till we crossed the mysore outer ring road. The stretch from there till Nanjangud was little uncomfortable, with narrow roads and few potholes. we stopped at Nanjangud to have our breakfast, all of us were starving. Had a good south indian breakfast and were on the way to Sultan Bathery . 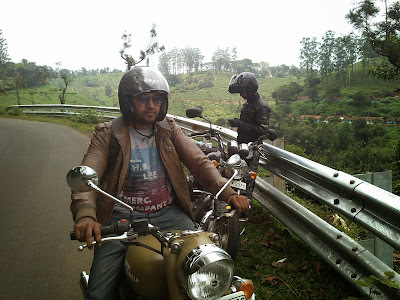 Again rode non stop for another 80+ KM to reach waynad forrest entrance. We were now crossing over to our "State 2 and Forrest 1" . 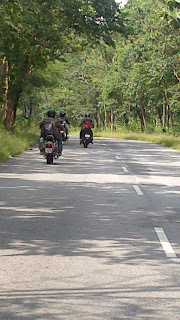 We rode slow in the hope of sighting some animals, atleast some elephants but no such luck. Usually on my previous visits to any of the forests, 'Posers' , the deers and monkeys were so easily sighted in large groups , so many that one would literally get bored of them. but today not even them, it was strange and disappointing, then Anoop mentioned that it could be because it rained the previous night and the animals would not have ventured near the road. In absence of any better reason, it sounded very convincing. So we rode on and finally reached Sultan Bathery around afternoon. Anoop and Pratap were to leave for Calicut from there whereas the 3 of us (Amit, Sharath and Me) had to decide if to stay and explore the place or move on. Amit Suggested we ride on and decide later and thats what we did. The plan to take an alternate route and not the one we took while reaching Sultan Bathery. 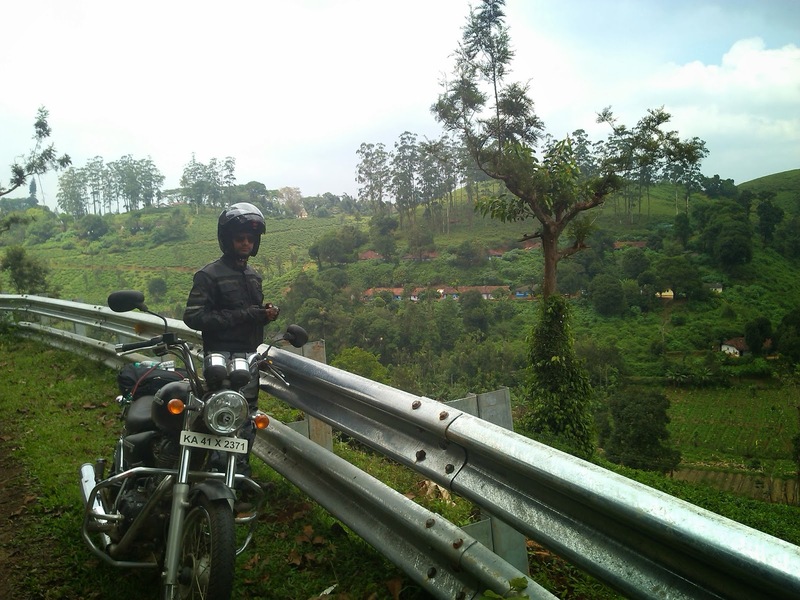 So we bid farewell to Anoop and Pratap and rode towards Gudalur, Tamilnadu and that was our "3rd state and the ride through coffee estates". It was a beautiful ride, with breathtaking scenery all around. I totally enjoyed riding on the curves while looking at the valleys and mountains all around. We stopped for a few mins to just sit and enjoy the nature , it was very peaceful. We had been riding since morning and the fatigue had started to creep in but it faded away in few mins with the beautiful green view and fresh air. We were good to go again. We stopped at a small restaurant/mess to have our lunch. ordered Chicken and roti, it wasn't bad. Now re-energized we rode towards Mudumalai National Park, our "Forrest # 2", it was hardly 10 KMs, again no luck sighting any animals, and we kept going at a slow pace and before we knew we were in Bandipur national Park "Forrest #3 and back to State #1", we with our our poor luck again could not sign any animal, but we did see few domesticated Elephants being given bath. So yes, we did finally spot our first animal in Forrest # 3 :) . Now my eyes had started to water and had started to feel sleepy, thanks to 3 hours of sleep the previous night and the almost non stop ride. When we reached Gundlepet, Sharath and me decided to stay back the night in some hotel there whereas Amit decided to head back to Bangalore. We founds a decent a hotel, ordered the early dinner around 6:00 PM and hit the sack.. I woke up and realised we missed the alarms set for 5:00 AM and it was 7:00 already, got ready in hurry and checked out of the hotel. Stopped to fill petrol, breakfast at a small dhaba and headed back Via Nanjangud - Mysore outer ring road - Mandya - Ramnagaram - NICE road - Bangalore. The Mysore outer ring road was awesome and scenic , so we stopped for a bit to click some pictures. 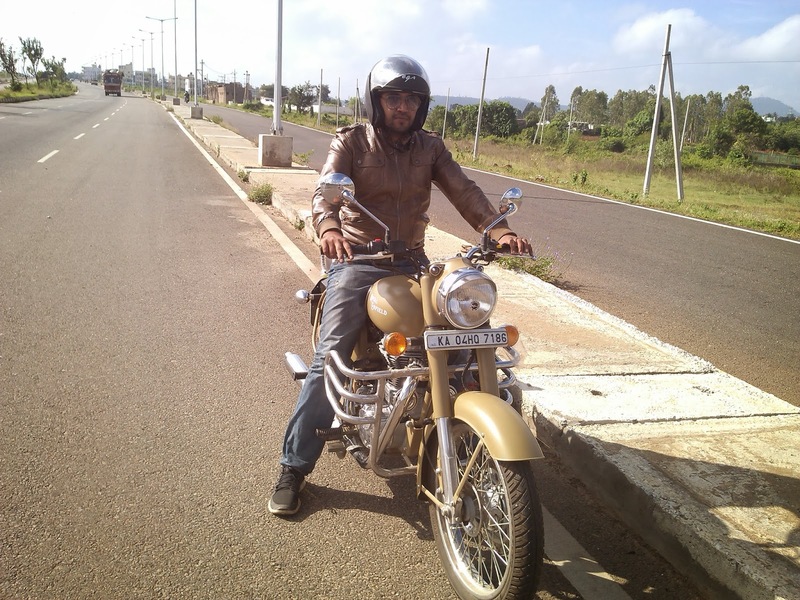 Rest of the ride was uneventful, Sharath stopped at Maddur to meet a friend and i headed back home. It was around 1:30 when i parked my bike at home and the odometer had clocked 650 KM. I looked at my machine which did not fail me once, felt really proud of it. Went in, changed and hit the bed. It was an amazing trip with almost non stop riding the first day. I realized that being on the road on my bike is the definition of freedom in its true sense. Remembered Amit's word "Journey matters more than the destination, so enjoy it while you can"
Well written...u must write more!